First of all, thank you for following along on the ORC or One Room Challenge. I finished! Despite the painting problems! 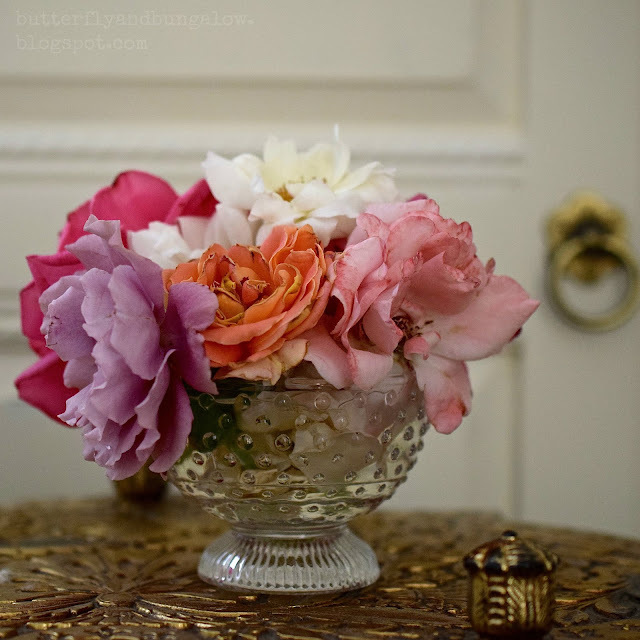 And I got this post up, typos and all, despite internet challenges yesterday! This was mostly a labor intensive project. I spent less than 400 dollars! Almost everything in this photo is more than a decade old. The mirror is antique. I painted and distressed the can, and it will be an upcoming blog post. Some time back, the statue was gift from my daughter. believe it or not, I bought them last year for 3 dollars each on clearance. The painting in the reflection is by John Enright. All the art in this room are paintings. Flowers from my garden on this side of the bed. On the lower shelf, I have this older box from Mexico that I have used for over a decade to store what I need such as medicine and cream. Besides the wall and a couple of cans of chalk paint, this table is where I spent most of the money that I allocated. For the side of my bed, I purchased this vintage table; it is probably from India. 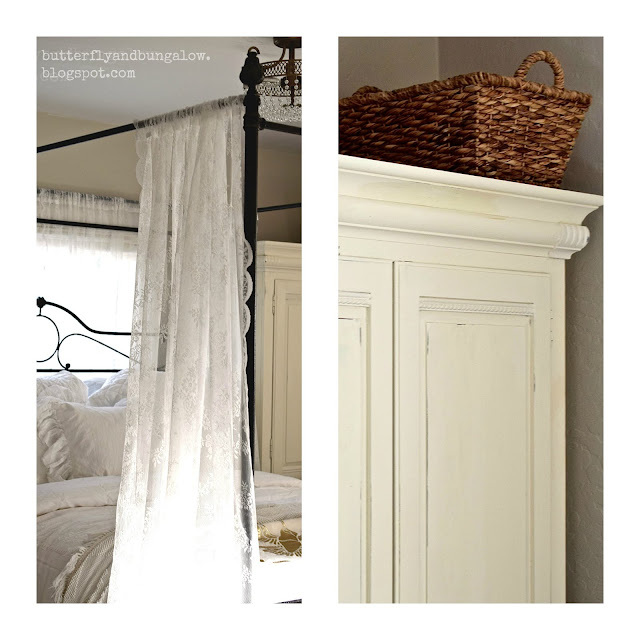 The size of the table allows me to open half the armoire, and it is easy to move if, I need what is on the other half. 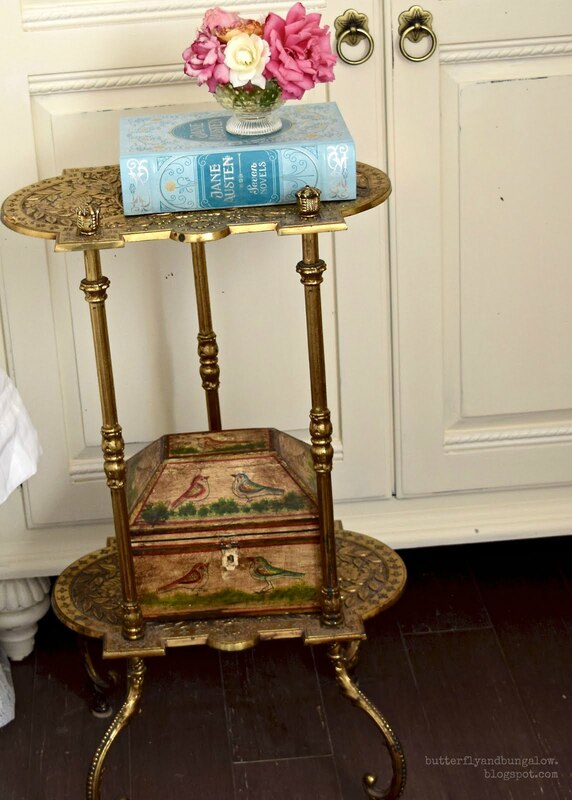 It is large enough to hold a book, a glass of water, and a bouquet, and I don't need a coaster, because it is made of metal. 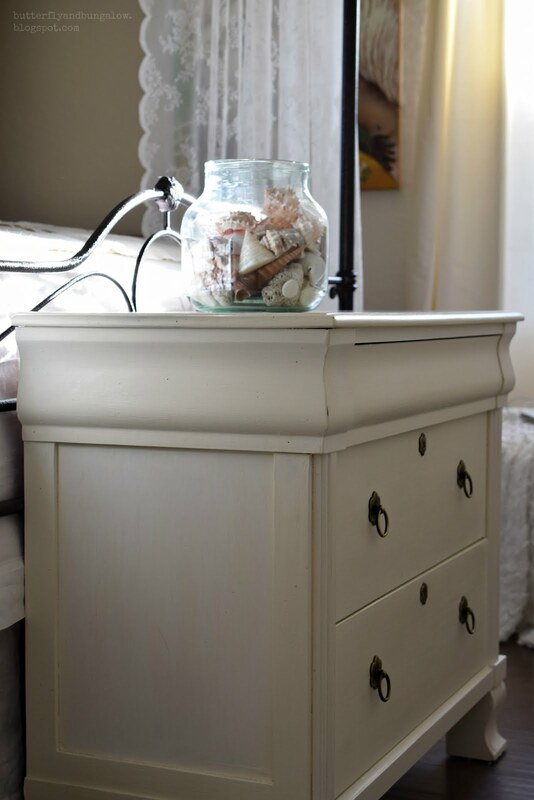 used Annie Sloan old white, Briwax lime wax, a pearl finish, and a light distressing to achieve this finish. The painting is by Linda Carter Holman. 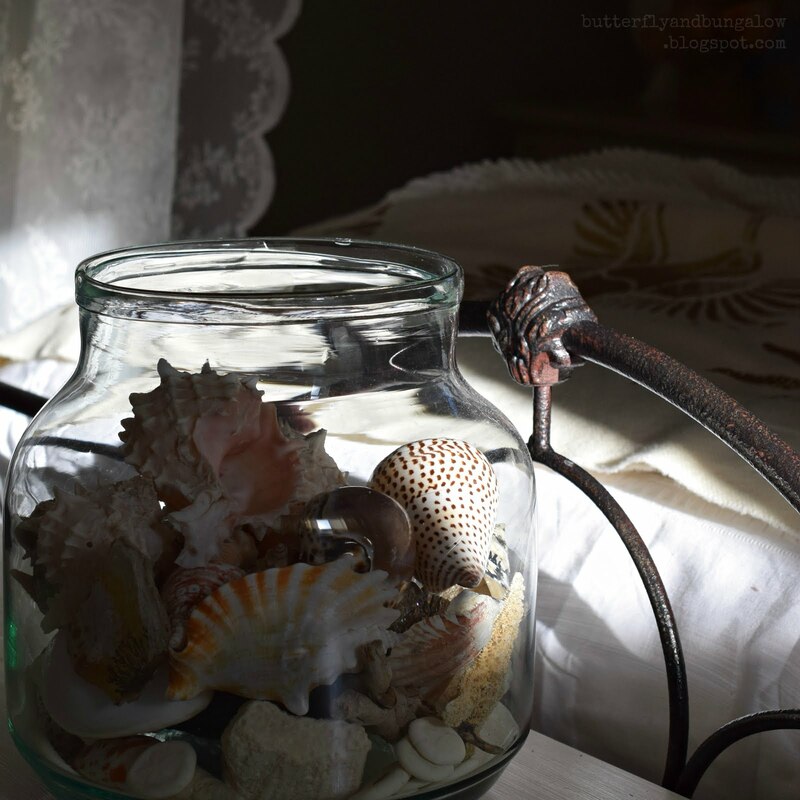 I placed my jar of shells at the end of the bed, but if I don't have a large bouquet in the bucket, I can put it there. A chair beside the window to look at the fountain. I had this chair, so all I did was move it here. The bedding is linen. 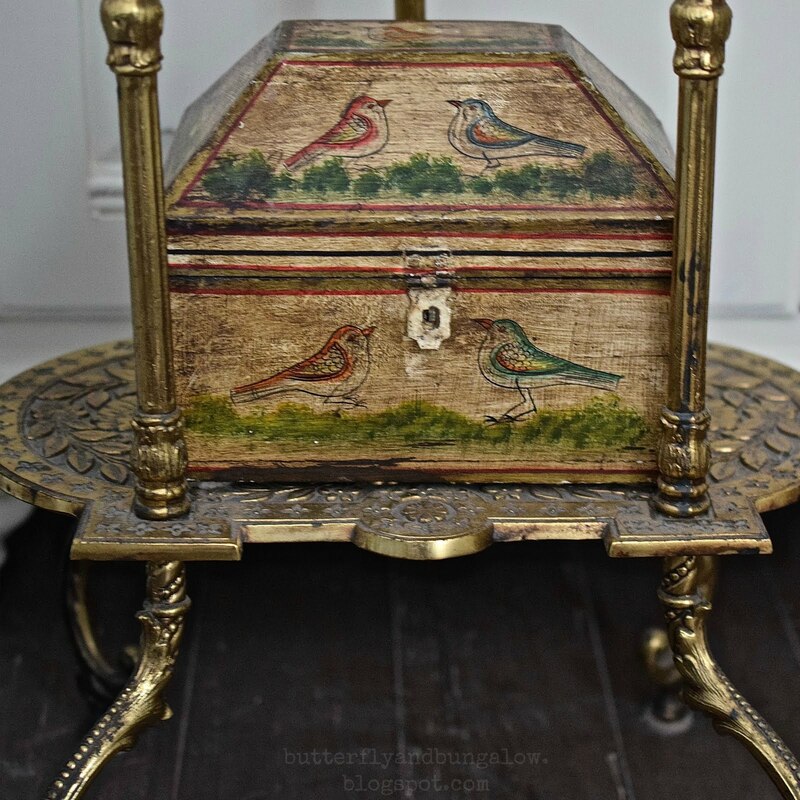 All that is new is the Italian throw with the hummingbird, which looks nice with the painted chest that has birds and the painted bureau with birds. My sister gave me the nubby blanket that belonged to my grandmother. I have a story about the blanket, but I ended up with two blankets. My spouse hung the chandelier that had been sitting in a box for awhile. A cat is usually on the bed. These are my favorite color shades of flowers. I used the same colors on both sides of the bed, but this side came from the market. The iron trellis is about fifteen years old, but I left it in the yard for about four years, so it looks even more distressed than it was when I acquired it fifteen years ago. 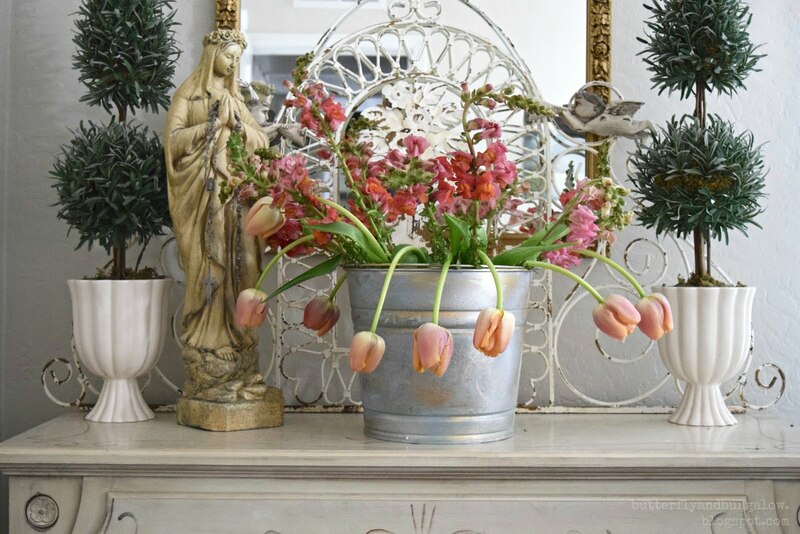 I love the Nordic rooms that you see in Jeanne D'Arc magazine. 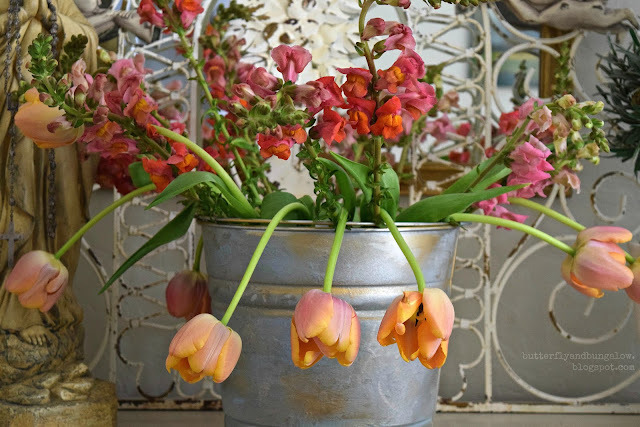 I think I have achieved it, though with a touch of boho color inspired by my love of flowers and gardening. It's a nice warm white almost the palest shade of butter in real light. This is the before. It was a pretty room, but cluttered, and I was tired of the green walls. One of the things I did was move this hand painted floral bureau to this room, and relocated the dark one to the library. This project ended up causing changes to two other rooms, so I might have future blog posts about those changes as well. See the links below for the before and all the problems encountered. 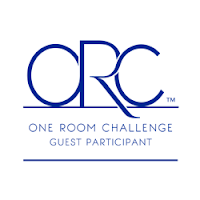 Thank you Linda of ORC, and everyone that followed along. This project consumed more time than I imagined, but I am happy that I am done! 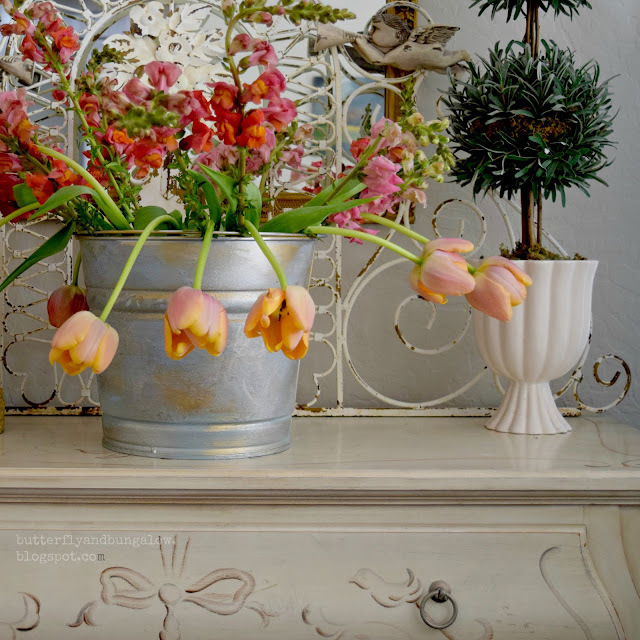 It shows that one does not have to spend much with a bit of paint, some vintage items, and what one has collected over the years. 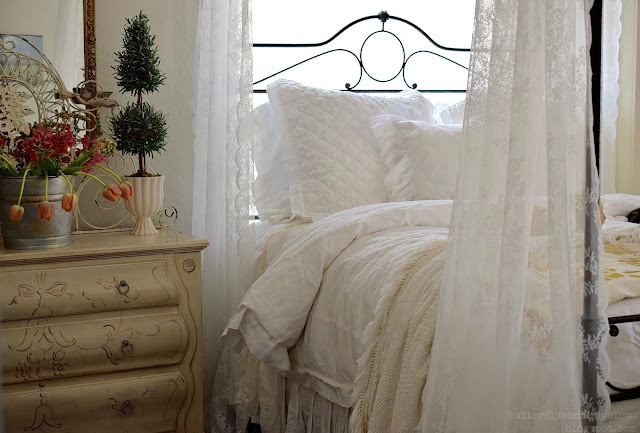 I look at your bedroom and think, romantic, serene and European. I think you achieved your goal. Lovely makeover Su! You made it a precious space and invested some good energy in this room. 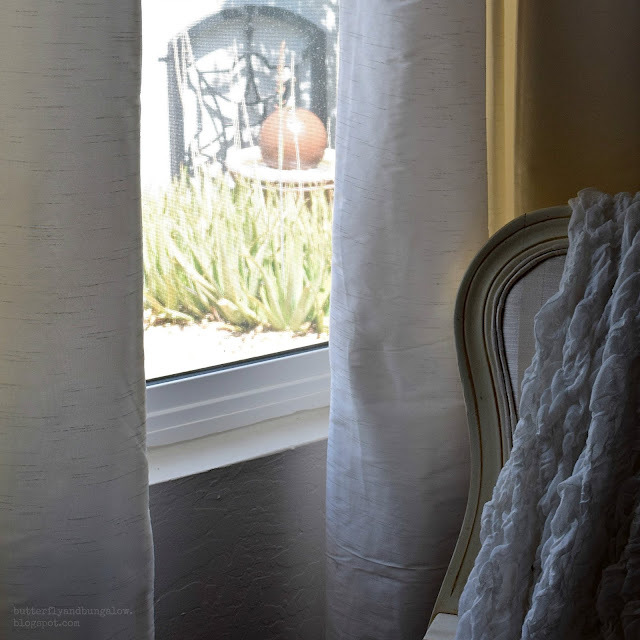 Love the soft color tones and a bit of splash of colors here and there! I love it all! I wanted to Pin some of the pics, but you don't have a Pin It button on your photos. I clicked on Week One to remind myself of what it had been. This is a beautiful transformation. I liked the old bedroom but this version seems like it has always been this way. Congratulations on a job well done! Beautiful! It looks so calming and peaceful. 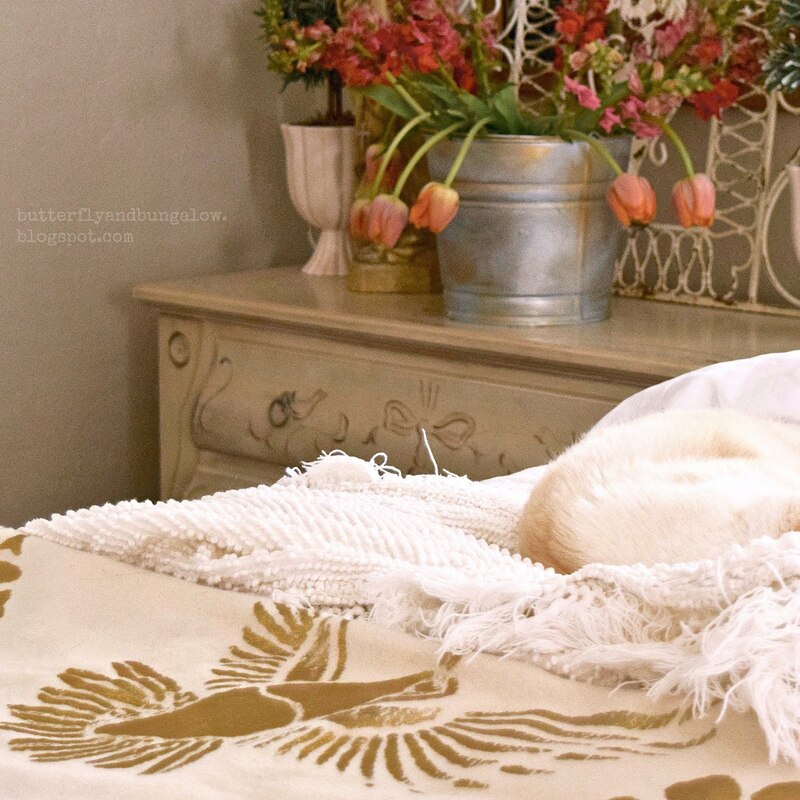 The flowers are a lovely touch and the cat finishes the look! Bravo!! What a beautiful sanctuary you created. Ahhhh so serene and pretty. 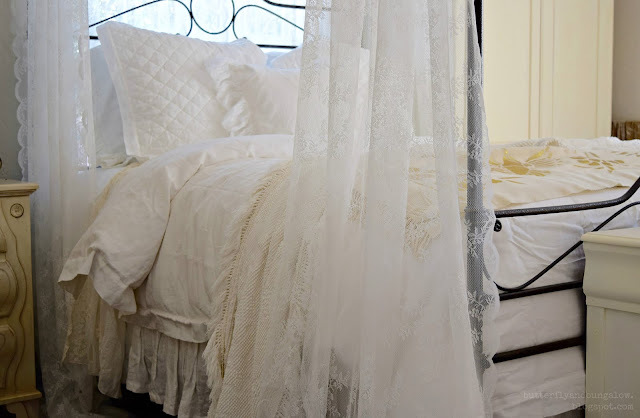 Love the canopy bed and the light lace pretty drapes from Ikea. Gotta love Ikea and especially their sales. Beautiful job. Very fresh and elegant! Fun to study all the pretty details in each photo. If your cats are like mine, I'm surprised you got the bed made, let alone layered so prettily. Good job! Well, my darling Su, your bedroom is truly changed, it is more bright and refreshing ... you've done really a great work, congratulations on your atste and on your ability, my friend ! Your room turned out so beautiful! I didn't even click to go back and see the before again as I didn't want anything to take away from the inspiration I got from seeing the finished room finally. I am so inspired I am planning to tackle my master bedroom and bath after two years of living with 15 different colored patches on my bathroom walls! Job well done Su. Your room is so beautiful and peaceful! Love it! The room turned out so bright, elegant, fresh and very romantic. I love everything. Su - GORGEOUS!! 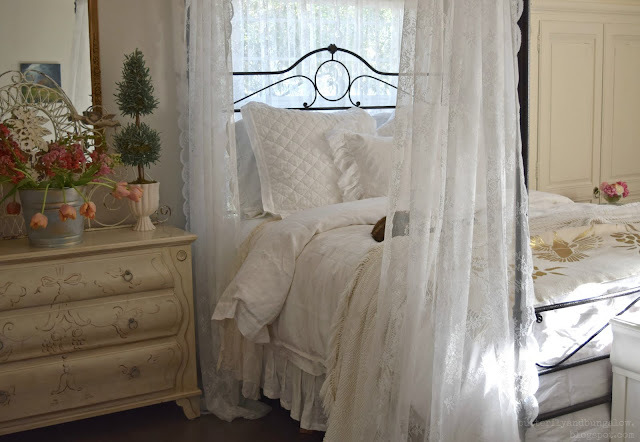 Love those lace curtains. Everything is just beautiful. Great job! Nordic-boho chic for sure! Just lovely!Congrats and Cheers for a job well done! Beautiful room to have sweet dreams! 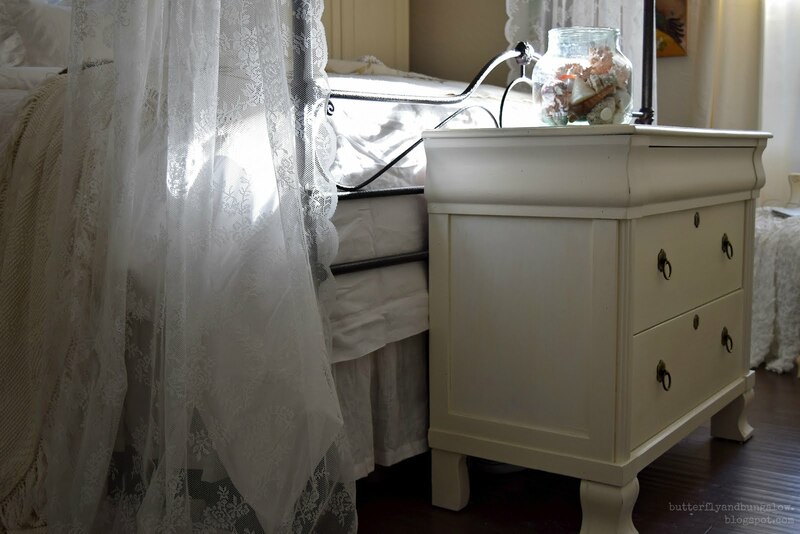 Your room make over is beautiful. So light and airy and creamy white. 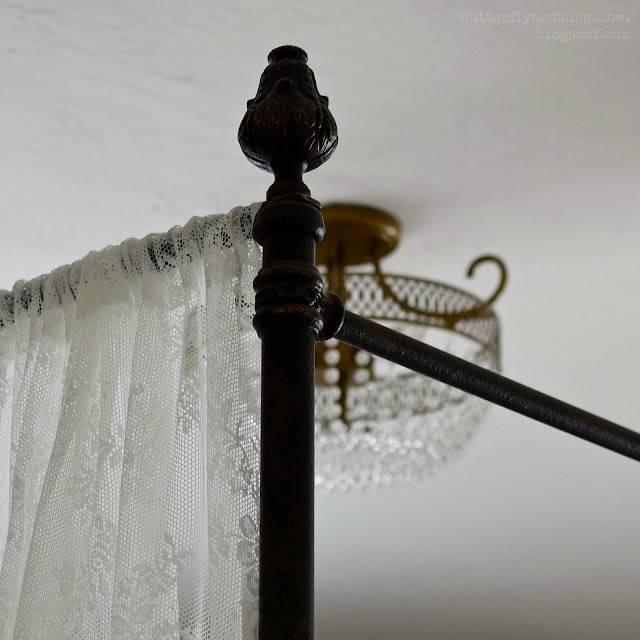 I have the same lace curtains from ikea and have seen them in so many of the issues of JDL. They give your bed that french nordic romantic feel. The ceiling chandelier is so pretty. 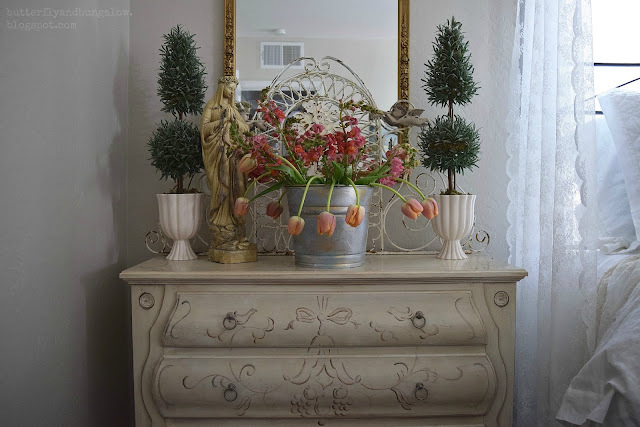 The one thing I would suggest is to remove the faux flowers on the chest of drawers and leave just the Madonna with the layered mirrors. 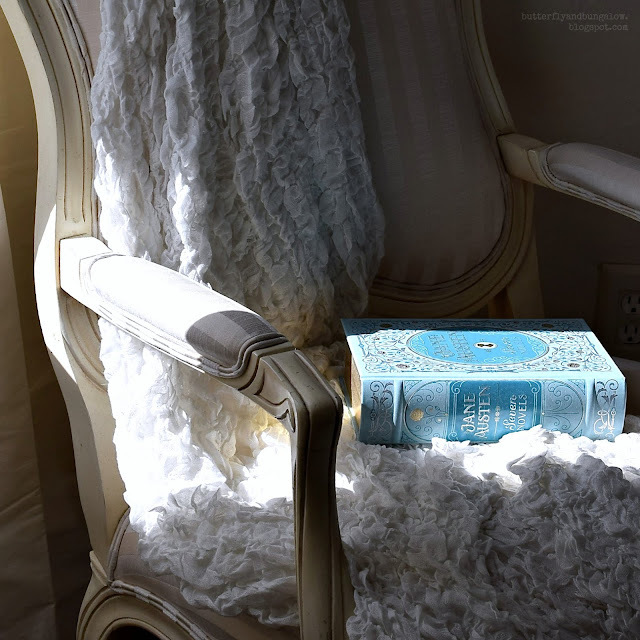 This would provide that calm that is found in the Jeanne d Arc Living. Your room turned out great. You have so many interesting furniture pieces and art. It seems very soothing and calm. Nice job. How lovely. The words that come to mind are 'serenity, calm, soft'....all words that mean comfort to me. The rooms looks lovely, serene and peaceful, very Jeanne d'Arc magazine like, I think. You've done an amazing job transforming the space. What a beautiful room. Everything is perfect. So worth the time and filtrating effort when painting was an issue, all said and done you have what feels like a whole bedroom to love, it is a new bedroom! 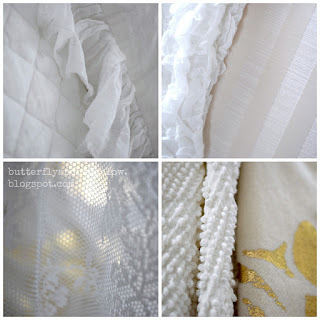 And I love what a little paint and lace can do for it. Well done. I love how it turned out. You have an amazing talent. You have an amazing eye for just the right pieces. A very beautiful room. I really like the flowers on your pretty dresser by the bed and the flowers from your garden on that gorgeous vintage table. The lace curtains hanging on the bed add an airy and romantic touch. I'll have to check out the magazine a couple people mentioned. I'm sure I would like that since I like your room so much! This lovely room turned out so bright, elegant, fresh and very romantic. Your master bedroom has such a soft tranquil feel to it with your choice of paint colors and bedding, Su. 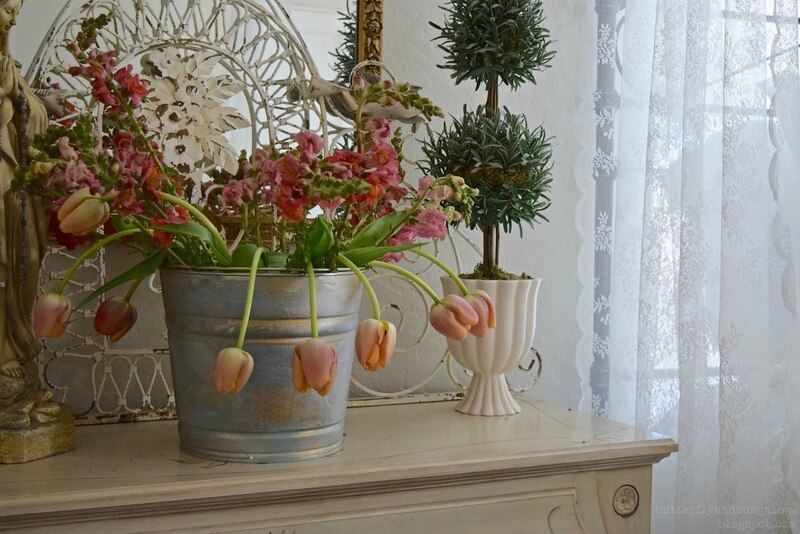 It's just lovely and the flowers from your gardens always add a nice touch to your home. Well done! My Mother's Day tulips are finally gone, but I need to buy some more to copy your tulip display. What a haven you have created. Congratulations on your ORC reveal! I love the box from Mexico. Gosh, I don't even know where to start. This room is so romantic and charming. You definitely have an eye for beauty. I can't believe how little you spent and what a transformation you made. Bravo!! It may have taken you longer than you expected Su, but well worth it. I love every single detail and the colours are so relaxing and serene. Well done... now you can simply enjoy it! Lovely room! that bed is swoon-worthy! Such a lovely space. Love the painted chest of drawers. Congratulations Su for an amazing job! You are so incredibly talented. I've told you time and time again, but I'll tell you again, ;) I admire your style so incredibly much. You've inspired me to make some changes in my room. One day, when we have money again. Our trip exhausted every last dollar in our account! Ha! xoxoxo Jen PS I love seeing kitty resting on your incredibly comfortable bed.